Competition: Win Captain America: The Winter Soldier on Blu-ray… and a Chocolate Pizza! Win Captain America 2 on Blu-ray & a Chocolate Pizza! As the summer comes to a close, and the days are getting colder, you’re probably thinking now is a good time to curl up on the sofa and watch a good movie. Well, thanks to the lovely people at Cash Generator, new and second hand DVD retailer, and Presents For Men, one stop shop for gifts for men and women, you can do just that with this awesome prize! One lucky winner will get a copy of the brilliant Captain America: The Winter Soldier on Blu-ray, and in case you get the munches half way through… an entire Chocolate Pizza to gorge your way through! How to win Captain America: The Winter Soldier on Blu-ray & a Chocolate Pizza! The competition closes on 5th September 2014 and is open to UK residents aged 16 or over. Always wanted to try a chocolate pizza, so pick me! Choose me, and I’ll raise my mighty shield and salute you! I’d love to win. The Captain America movies are by far the best of the Marvel bunch, and it’d be absolutely brilliant to be watching the new one while munching on that delicious looking choccy pizza! I work with someone called Chris Evans, and its ever so mildly amusing to mention that I was watching him last night! Plus its an awesome film which I have yet to see! now the kids are back to school and the early nights have begun a good excuse to curl up on the sofa with hubby for a movie night and chocolate what more could you want ….. and i think after 6 weeks of the kids owning the telly it’s time me and the hubby get control back !!!! I’d love to win this prize for my husband – it’s basically two of his favourite things in the world, and it’d win me serious brownie points (what’s the eat-by date on the pizza btw?!)!! Id love to win this! I can imagine sitting on the edge of your seat watching this amazing movie can use up a lot of calories; cant think of a better way of sorting that out than with a chocolate pizza. Certainly a winning combination! I’d love to win this! I’d like to be sociable but a whole chocolate pizza to myself sounds more likely! Great choice. A fab night to be had there. The perfect excuse to invite the mates round to watch an awesome movie with plenty of chocolate to share. I want to win I love all the marvel films so would love to add this to my collection!! Just nice to get to see a film that i will not normaly pay to see. Captain America and chocolate? gimme gimme gimme!!! 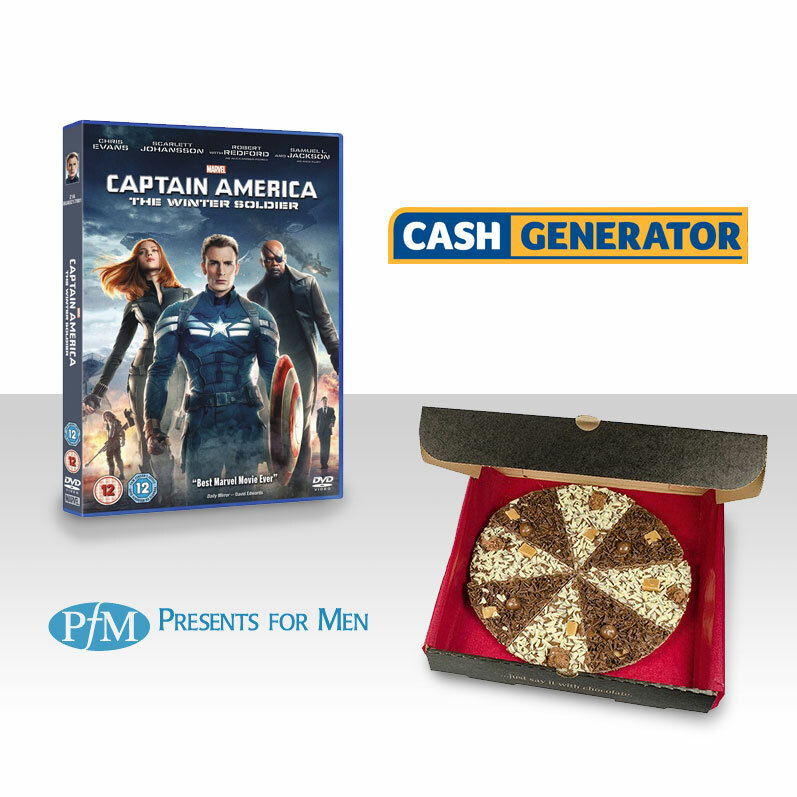 I’d love to win….I’d use the pizza as Cap’s mighty Shield…well until the wife and kids munched it all! I’d love to win this so I can give it to my older brother. He and his wife are expecting their first baby due any day now and I reckon this would be perfect entertainment to help him survive those hours and hours of labour! I would really love to win as I want to give it as a surprise present to cheer someone up. we are a family of marvel fans! I’d like to be Captain America the WINNER Soldier.. Arf. I’d like to Soilder on this Winter by getting a pizza the action! I want to win because I love Pizza and chocolate so a chocolate Pizza would be amazing! Also I love this movie!!! I would love to win as I love the Marvel movies but it would also be excellent fun to wind up my son! And chocolate pizza 🙂 What more could a girl want! Gimmee! Moving house this weekend and this would be a great way to relax and be lazy for a bit afterwards! Would like to see this film. And chocolate pizza. Fantastic! I want to win because….chocolate pizza! I want to win because I don’t own any Blu-rays yet so this would be my first – and I’m a huge Marvel fan!! I would love to win this wonderful dvd to keep my son and daughter entertained, the school holidays are nearly over and we have run out of money. I can think of nothing better than sitting on the sofa munching a chocolate pizza and watching Captain America The Winter soldier! Please pick me for my sanity ???????????? Would like to win please! I’d love to win, as it’d be a nice treat for the weekend. My son starts school this year and he takes after me and my fiance with his comic book / film addiction so would be nice to chill at the weekend watching this and munching on a choccie pizza!